After years of struggle, Alexandre and his wife, Daise, also began receiving death threats for their work to protect the environment and the rights of the local fishers. Since 2009, Alexandre and his family have been under 24h police protection issued by the Human Rights Defenders Program. Tragically, Almir Nogueira de Amorim and João Luiz Telles Penetra, leaders of AHOMAR, were brutally murdered one month before this photo was taken. They were found on the 24th of June 2012, in the bay tied to their boat, weighted down and drown. The day before this photo was taken one of Alexandre’s guards was shot and murdered steps away from where they stand in the photo. 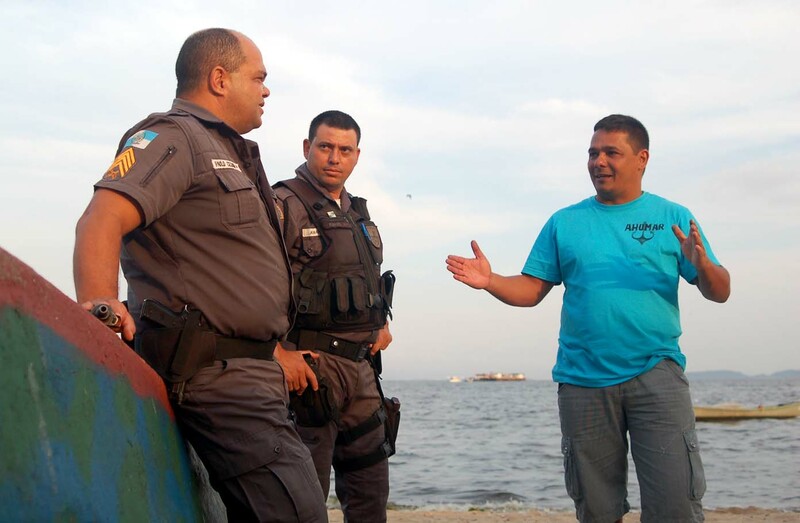 “This is a moment of a lot of suffering, a lot of sadness because of the violent eviction of the local fishers from where they have always lived and have been a permanent part of the local culture, where people have lived in harmony with nature…. Today in Guanabara Bay we are totally worried about the petrochemical industry, including the submarine oil pipelines, oil terminals, platforms and new oil refineries that are being constructed. All of this is affecting the local fishers because it is difficult to find a good place to fish. The oil expansion in Rio is a new moment of petroleum in Brazil. We have seen this process develop so quickly and how it is causing the expulsion of the local fishers because the oil leaks into the water and causes a huge impact. We see this pollution as an invasion and it has much more profound impacts on the fisheries in this region because it kills a lot of fish stocks which brings about the end of the fishing commerce and local tourism in the region.